The society was formed in 1927 and has recently celebrated it's 90th Anniversary. 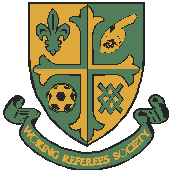 The society area covers referees in Woking, Chertsey, Knaphill and surrounding areas. Meetings are held at Meadow Sports Football Club, Loop Road on the first Monday of the month (except in August or if the first Monday is a Bank Holiday, when the meeting takes place on the second Monday). Meetings commence at 8:00. All members and non-members are welcome. We are members of the Referees’ Association and are affiliated to Surrey County Referees Association. We usually have around 60 members each season from all standards of refereeing. We currently have members that officiate at all levels of football including The Football League, Conference, Isthmian League, Combined Counties League, Suburban League, Surrey Elite League, Surrey Intermediate League, Guildford & Woking Alliance League, Surrey and Hants Border League, Surrey Primary Youth League and Surrey Youth League. Meetings, are informal social occasions where we discuss all aspects of football and refereeing over a chat and a drink. At meetings we have either a guest speaker or a discussion topic for the evening.